Welcome to this week's edition of Cider Sunday. Today's cider by Napoleone & Co is from the Yarra Valley in Victoria, a region reported to be the original home of Australian cider since the early 1900's. 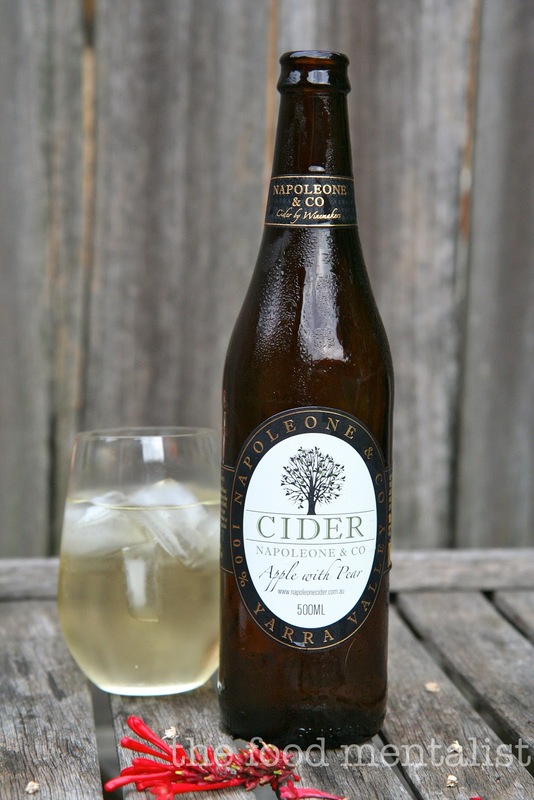 In production since 2008, Napoleone & Co Cider is crafted on site at Punt Road Wines. The Napoleone family are passionate fruit growers and winemakers and with over 250 hectares of orchards, and are one of the biggest producers and wholesalers of stone fruit and apples in Australia. Tasting this cider for the first time, I found it quite complex and it's unique flavour is the result of several apple and pear varieties including Fuji, Granny Smith, Pink Lady, Packham and Beurre Bosc. Although on the sweeter side, this one exudes sophistication and it's not just because it is crafted by winemakers. This cider is produced in small batches to ensure it's freshness and it is fermented using a white wine yeast from the Rhone Valley in France. With prominent apple flavours and lovely hints of pear, this cider has a crisp clean finish, fine carbonation and is perfectly well rounded. Extremely easy to drink, I love the fact that this cider doesn't have any strong alcoholic flavours. It is light, refreshing and ultimately delicious. Pair this one with white meats, seafood or perhaps a delicious spicy Asian style salad with lots of fresh vegetables and herbs. Yum! At 4.5% alcohol, a 500ml bottle of this cider will provide you with 1.78 standard drinks. Vintage Cellars & 1st Choice Liquor outlets. This cider is also available throughout Australia. Click here to check out where you can purchase it in your local area. Which cider are you enjoying this weekend? I think I'd really like this cider as I do like sweeter ones :) Happy Cider Sunday Erin! Napoleone is one of my favourite ciders! It has a wine-like quality, I'm sure that's hardly a technical term but I just love it. Excellent to cook with, too. Yum, this sounds wonderful. Keep up the great work, Erin, love your posts. Thanks for the tip Alana re cooking. I am really starting to embrace cooking with cider. Thanks Lorraine & Lizzy - happy cider sunday!